Lori Pelletier, an IAM Local 700 member and head of the Connecticut AFL-CIO, testifies at a recent Senate hearing on women’s economic security. IAM Local 700 member and Connecticut AFL-CIO Executive Secretary-Treasurer Lori Pelletier stressed the importance of collective bargaining to women’s economic security and called on Congress to raise the federal minimum wage and fully fund labor standard enforcement agencies at a recent Senate hearing. Full-time working women earn 77 percent of what their male counterparts earn – and the pay gap hasn’t budged in over a decade, according to the latest U.S. Census Bureau statistics. For African-American and Hispanic women, the disparity is even greater. One way to help close that gap, Pelletier said, is a union contract. Pelletier pointed out that the share of women workers who have employer-provided health insurance is 18.4 percentage points higher for union women, and the share of women workers who have an employer-provided retirement plan is 22.8 percentage points higher. 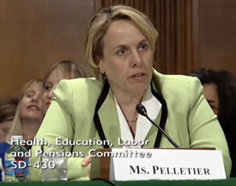 Women in unions are also more likely to have paid family leave and short-term disability benefits, Pelletier said. And even though union members are unlikely to be making the minimum wage, Pelletier said the labor movement stands behind recent efforts to raise the wage floor to $10.10 an hour. Women made up about two-thirds of all workers who were paid minimum wage or less in 2013, and 60 percent of full-time minimum wage workers, according to the Bureau of Labor Statistics. Connecticut recently passed legislation to increase the state’s minimum wage to $10.10 an hour by 2017 and was the first state in the country to require paid sick days. “Our members are not the main beneficiaries, but we understand that everybody does better when everybody does better,” she said. Pelletier stressed the importance of agencies such as the Department of Labor and the Occupational Safety and Health Administration (OSHA) which enforce laws that keep workers from being exploited. The agencies have been under attack by Republicans in Congress who say they have created too many workplace regulations. “By claiming ‘government doesn’t work’ and then gutting the budget of enforcement and protection agencies because they represent ‘big government,’ they are making sure government doesn’t work as well as it should,” said Pelletier. Click here to read a transcript of Pelletier’s opening testimony. Click here to watch the entire hearing.